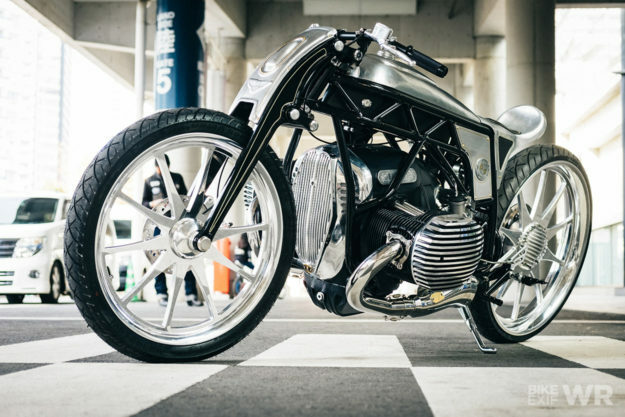 We’re in constant awe of the Japanese custom motorcycle scene. 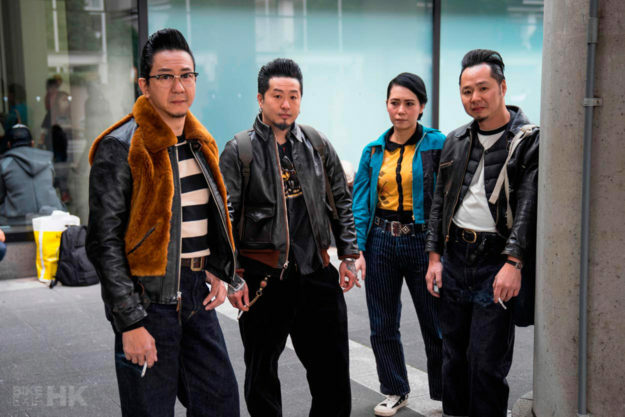 Our compadres in the Land of the Rising Sun have an approach to customization that’s as unique as their culture—hallmarked by unrivalled levels of creativity and craftsmanship. But thanks to geographic and linguistic limitations, it’s a world we mostly admire from afar. 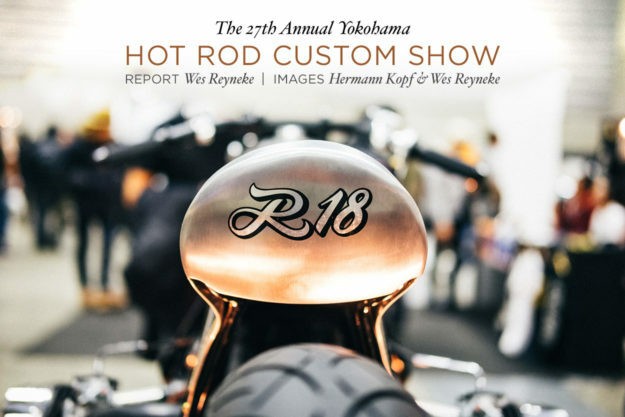 The Yokohama Hot Rod Custom Show is the best of Japan’s custom moto (and hot rod) scene, distilled down to a potent one-day hit. And last Sunday, I was there to take it all in. Also known simply as the Mooneyes show—after the company that’s been organizing it for 27 years—it’s a must-attend event. 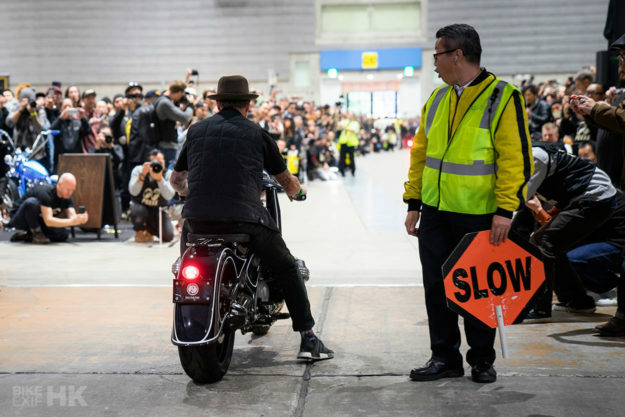 Roughly 300 motorcycles, and twice as many cars, cram into the Pacifico Yokohama convention center. And an estimated 15,000 spectators pour through the doors. It attracts the biggest names too, both domestically, and from across the water. 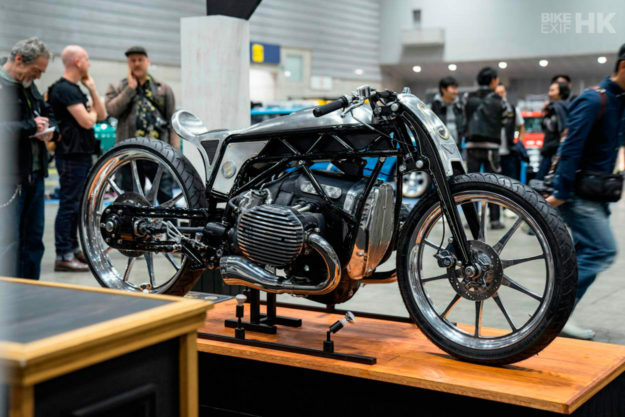 Kengo Kimura of Heiwa showed off his BMW R75/6. Kaichiroh Kurosu of Cherry’s Company brought along a chopper that floored me. And Shiro Nakajima of 46Works revealed two knockout builds that we’ll showcase soon. Winston Yeh of Rough Crafts (above) popped over from Taiwan. 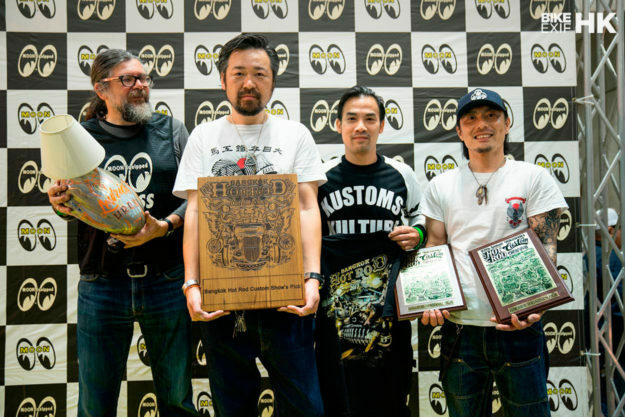 Go Takamine of Brat Style, Shinya Kimura (below left) and Roland Sands (below right) all made the trip from California. 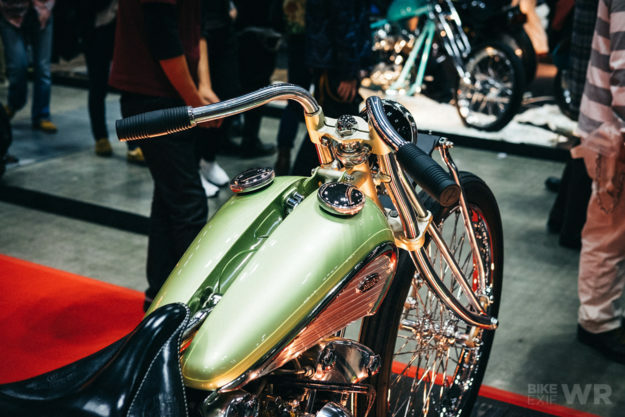 Countless bikes from smaller builders were strewn between the big names, making it impossible to take every detail in. And there was a lot of detail: from exquisite paint jobs and pin striping to intricate engraving and next level engineering. I even strolled past a monstrosity that’s powered by two (yes, two) ironhead motors; the work of Hot Chop Speed Shop. 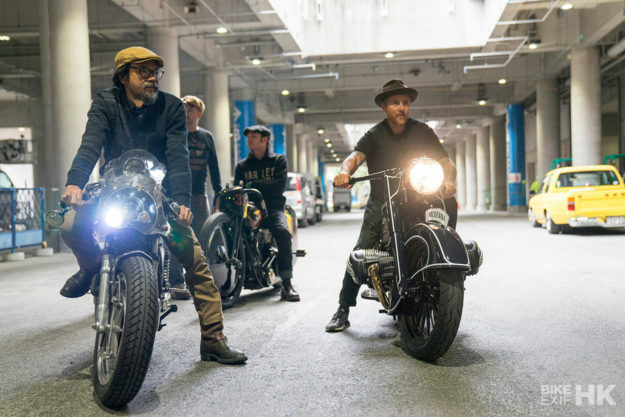 But I was there for one bike in particular: a ground-up custom from Custom Works Zon, dubbed ‘Departed.’ BMW Motorrad commissioned the project, so they flew a select group of journalists out to see it in person, soak up the show and experience Tokyo for a weekend. 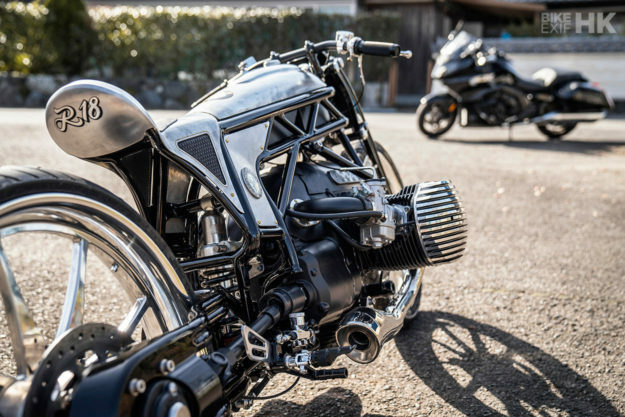 The bike’s powered by a prototype engine, that BMW tell us may or may not make it into a future model. It’s a boxer—but it’s far heftier than any boxer currently in the Bavarian marque’s lineup. Zon’s Yuichi Yoshizawa and Yoshikazu Ueda were given only the motor to work with, but even that wasn’t left alone. The ‘breast plate,’ valve head covers and air box are all custom, and the guys added in a pair of Dell’Orto carbs on one-off intakes. The rest of the bike is almost completely hand made. Zon built a steel trellis frame, then capped it off with hand-shaped sheet metal bodywork. The BMW rolls on custom alloy wheels, measuring 21” up front and 26” out back. It’s held up by girder fork up front, and a custom-built swing arm with a mono-shock out back. I quizzed Yoshizawa-san about his inspiration, and he cited land speed racers as a reference. He also walked me around to the back of the bike, and pointed out how the entire machine is sleek and streamlined, to emphasize the sheer mass of the motor. In typical Zon fashion, the craftsmanship is outstanding, and the build is littered with stunning details. There’s the inventive gas cap, the subtle striping and gold work, the gorgeous hint of leather on the barely-there seat, and the tasteful Zon/BMW mash-up logo up top. (We learned this weekend that ‘Zon’ means ‘sun’). 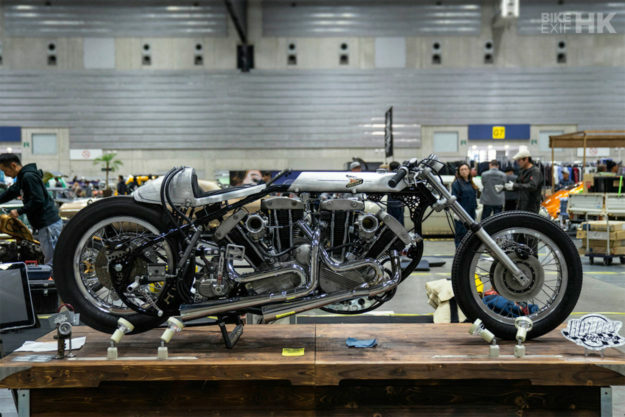 Custom Works Zon took home the coveted ‘Best in Show’ award, along with two additional judge’s picks. I wasn’t the least bit surprised—it’s an astounding machine, and easily my favorite bike at the show. 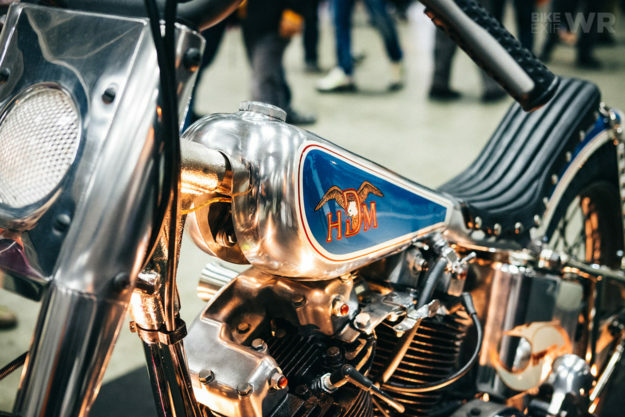 The Hot Rod Custom Show is more than just pretty cycles and hot rods though: it’s a colorful, whacky celebration of all that Kustom Kulture embodies. I wandered around the venue with old and new friends for hours, navigating through the flea market-like sections between vehicle displays. We saw everything from patches to hand-made key rings; Japanese denim to unique Hot Wheels collectables. 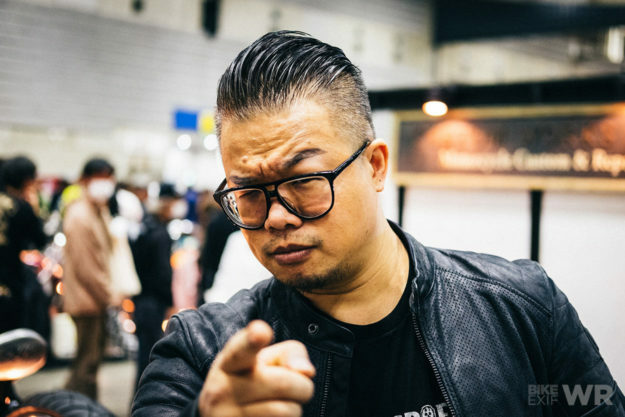 We witnessed lengthy queues as devout fans lined up for exclusive Mooneyes merchandise—including one-off Vans that are only sold at the event. 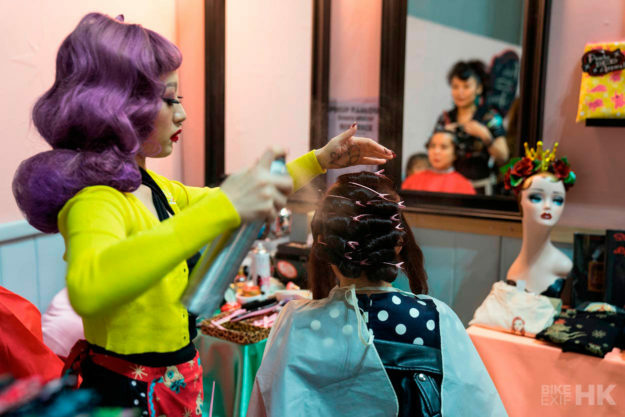 There were artists, tattoo artists and pin stripers all hard at work—and even hairdressers. 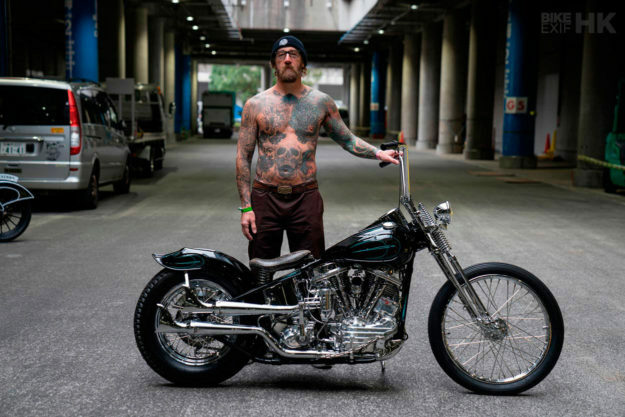 The show is a true melting pot, a blend of Mooneyes’ SoCal style and Japanese tradition. 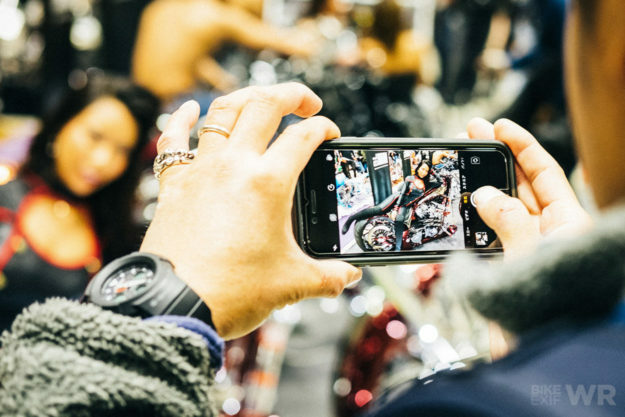 It’s amazing how polite and orderly the rough-hewn world of motorcycles and hot rods can be: passersby will even pause for you to take photos of the machines on display, to avoid walking through your frame. It’s also hard to believe that a show of this magnitude occupies just one day. 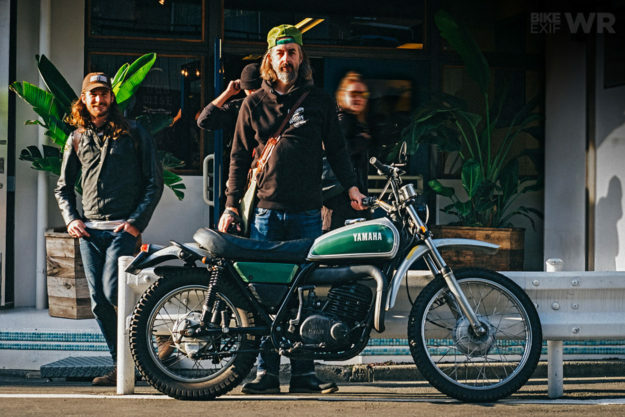 I spent the rest of the weekend exploring as much of Tokyo as I could, along with Hermann Kopf (below center) of the Brummm Chronicles, Chris Nelson of Iron & Air, and Morgan Gales of Hot Bike (below left)—who are all an absolute riot to kick it with. We wandered around the Shibuya and Harajuku area, dipping in and out of quirky fashion stores and thrift shops. We visited Japan’s largest BMW dealership, ate tacos, drank Japanese whisky, and wrapped up the weekend up with a traditional shabu shabu meal. Then—just as I found my groove—I hopped on a plane home, roughly 48 hours after I’d first touched down. 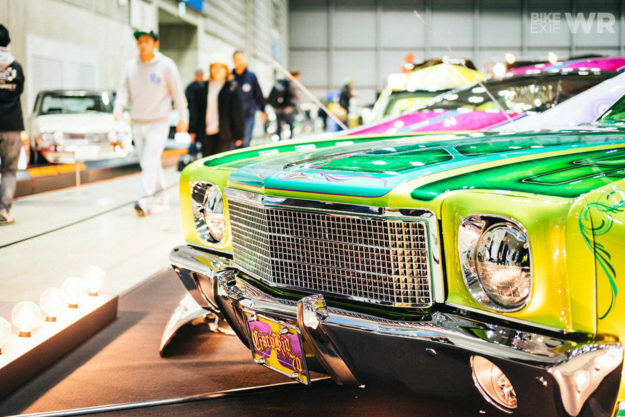 Japan left a mark on me: her peculiar customs, her heated toilet seats, Tokyo’s relentless buzz, and the extravaganza that is the Hot Rod Custom Show. I left exhausted, but inspired…and itching to go back. Images by Hermann Kopf (HK) and Wes Reyneke (WR), with special thanks to BMW Motorrad and Tadashi Kono.